The Department of Nephrology at the University Hospital Charité Berlin, headed by Prof. Dr.med. 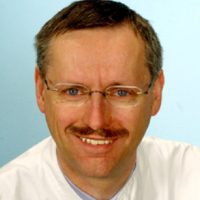 Walter Zidek, specializes in nephrology, transplantation medicine, treatment of kidney failure and hypertension. Since 2013, the Department is the certified Hypertension Center (certificate of the German Hypertension League, DHL) as well as – in cooperation with the Department of Vascular Surgery – the certified Interdisciplinary Shunt-Center. The Department of Nephrology under the lead of Prof. Dr.med. Walter Zidek, located at the Benjamin Franklin Campus, has been treating patients since the mid-60s in the following specialized areas: nephrology, dialysis, interdisciplinary intensive medicine, transplantation medicine, shunt procedures. Annually, more than 2,500 patients are treated here on the inpatient basis. The main focus of the Department is on treatment of nephrological diseases. A well-established team of physicians and highly qualified nursing staff, available at the Department, administers the latest medical technologies. A great attention is given to the treatment of different forms of kidney failure. In particular, in addition to the integrative therapy of patients with hypertension and/or diabetes, the Department also has special expertise in treatment of patients with different glomerulonephritis, interstitial nephritis, vasculitis or other rheumatological diseases. Department of Nephrology, Transplantation Medicine, Hypertensiology and Intensive Medicine.